Leo Hamel Fine Jewelers offers Father’s Day Gifts featuring exotic materials such as: dinosaur bone, fossilized coral, Wooly Mammoth tooth, and meteorite. What to buy the father who has, well, practically everything? Families across the U.S. spend $12 billion a year in honor of Father's Day. But the flood of appreciation doesn't have to consist solely of ties or gift cards. Whether the men in question like to camp, watch sports, or play with gadgets, they deserve to be recognized in a way that's as unique as they are. Leo Hamel Fine Jewelers is excited to share San Diego’s secret to finding the perfect gift for Father’s Day. Thanks to the ingenuity of the William Henry line of finely crafted collectibles, gift givers will have more options this year than just what color of tie to buy. The artisans at William Henry Studio create a range of gifts for all kinds of dads, from pocketknives for the camping enthusiast and cufflinks for the fashion forward man, to writing instruments for the studious dad and golf divot repair tools for the gold aficionado. William Henry designs and materials are like no other. Handcrafted in a small shop in Oregon, some of the pieces feature such rare exotic materials as 100 million-year-old fossil Apatosaurus dinosaur bone, 10,000-year-old fossil Woolly Mammoth tooth, prehistoric Gibeon meteorite fragments, and 110,000 year-old fossilized brain coral. Touches of gemstones contribute to a seamless blend of state of the art, exotic, and classic materials for a distinctive heirloom-quality look. The extraordinary artistry and the character of the materials make this brand’s every creation one-of-a-kind. These limited edition treasures make the perfect gift for the man who has everything. You can't go wrong with a stunning gift from the William Henry line. Leo Hamel Fine Jewelers invites customers old and new to browse their extensive inventory from William Henry Studio to find the perfect gift for Dad. 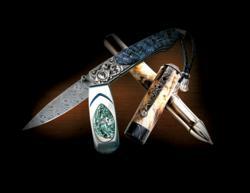 For more information, visit their showroom in San Diego, call 619.299.1500, or go to http://www.leohamel.com. Leo Hamel Fine Jewelers has been buying and selling jewelry in the San Diego area for over 32 years. Just last year they were voted San Diego’s Best Designer Jewelry in the 10News.com A-List contest, San Diego’s BEST Jeweler in the Union Tribune’s SD BEST poll, and San Diego’s Best Jewelry Store in Citybeat’s 2011 Readers Poll. Leo Hamel Fine Jewelers’ showroom in San Diego near Old Town is the only location to offer watches and jewelry for sale as well as watch and jewelry repair. Nine jewelry buying locations in San Diego, La Mesa, Solana Beach, Oceanside, Escondido, Rancho Bernardo, Chula Vista, Scripps Ranch, and El Cajon specialize in buying your unwanted gold, jewelry, and fine watches. For more information about this press release, please contact Paloma Colón at 619-299-1500 or paloma(at)leohamel(dot)com.